It’s essential to keep your tires at the right pressure for the sake of safer driving and a whole bunch of other safety reasons. Unfortunately, not all gas stations have well-maintained gauges that you can rely on. This is the main reason why you should invest in your own pressure gauge that you can use anytime, anywhere. Get to know the best tire pressure gauges today! Why Should We Need A Tire Pressure Gauge? What Are The Types Of A Tire Pressure Gauge? What Are The Features We Should Look Out For? When you maintain your tires at the right pressure level, you can actually save hundreds of dollars in fuel especially in the long run. Understandably, having the correct inflation will prevent your tires from wearing. Keep your tires from under or over inflation with a gauge. Under or over inflation is the primary cause of tire failure. This could result in a dire accident. Love your tires and they will love you back. Maintaining them will contribute to a better vehicle performance. 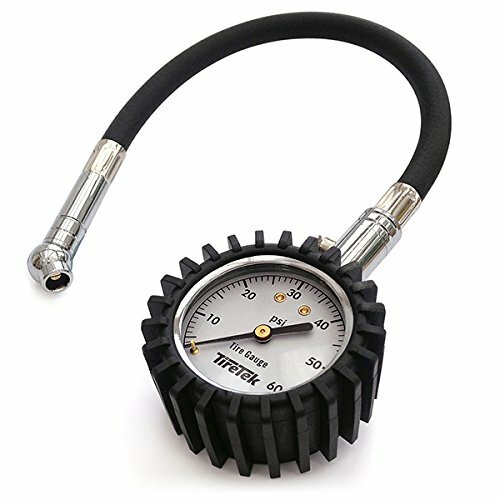 From the name itself, a tire pressure gauge is a device used to measure the internal pressure of tires. It works by having calibrated rod connected to a scale that tracks the movement of a piston. When you attach the pressure gauge to the tire’s valve system, the pressurized air will enter the piston, making it expand. The rate of the volume expansion of the piston is directly proportional to the rate of air pressure; this is how the gauge measures the pressure. The air pressure will cause the piston to move. Meanwhile, a spring at the other end will also push against the piston with the equivalent force the air is exerting at the opposite end. This is to balance the air pressure’s force inside the cylinder and to keep the piston against a sudden movement to the cylinder’s far end. After attaining a balance between the two forces, the calibrated rod can now determine the pressure value because it has been moving simultaneously with the piston. There are actually three types of tire pressure gauges: dial, digital, and ballpoint pen. In this article we will only tackle with the first two because they are the more popular choices and are universally used by car owners and mechanics around the globe. A dial gauge looks like a clock; it is round with a simple needle as an indicator and has the corresponding numbers in its circumference. This type has an analog dial. It’s beneficial to look for dial pressure gauges that has added features. The products featured in this articles are larger than typical pocket-sized gauges. But being large comes with a lot of perks; it means more features. These may include a bleeder valve, extension hose, shock-resistant cover, and even dual scale dials. You may want to look out for something with a bleeder valve and shock resistant cover. The former will let you release some pressure to a desirable level; while the latter ensures your unit is guarded against harsh conditions. Though they don’t necessarily contribute to accuracy, they are still highly essential especially when it comes to durability and making the device last longer. The dial type is typically bulkier and cost a little more expensive than the other type – but it certainly is worth every penny spent. The analog type is also ideal for people who want to measure pressures in a more traditional way. Some say it is more fulfilling to manually read the gauge than rely in a digital screen. Digital pressure gauges are more advanced since the factor of technology steps in. This type features an LCD screen where the pressure is displayed. The screen is similar to that of a calculator; only smaller. The primary advantage of the digital type is you don’t have to manually read the pressure yourself. The device will do the job for you. All you need to do is to engage the device to the tire valve and simply read the digital display. Another thing you’ll like about this type is it’s more resistive to dirt and dust. Their design isolates all the important components inside, locked away from dirt elements that could have potentially harm its reliability. You need to find those models with more features like the ones featured herein. Things like nozzle light and durable design is a really big plus. However, one downside of digital pressure gauges is they rely on batteries. Batteries can eventually degrade, consequently affecting its function as a whole. Technology has come a long way to the point where even tire pressure gauges are now digital. The AstroAI digital tire pressure gauge is the first on our list that works with an electronic system inside. It has an LCD backlit display for clear viewing both during daytime and nighttime. The nozzle itself is lighted – giving you visibility in darker areas. The advantage of having a digital pressure gauge is you no longer have to make manual guessing when reading the pressure level. The digital gauge already does the job for you – you just have to read the LCD. This advanced gadget is composed of an ergonomic design. You won’t have any difficulty holding the device as the non-slip texture makes handling compatible both for men and women’s hands. The AstroAI offers accurate reading you can easily rely on. It features four settings with a maximum range of 150 PSI. More range info from the manufacturer include 0-10Kgf/cm² or 0-1000KPA / 0-10 Bar. However, the most important thing to know is the 150 PSI capacity. This nifty little gadget has a smartly designed nozzle – after engaging with the valve system, it quickly forms a seal. This results in a fast and precise analysis on the pressure level without wasting too much air. 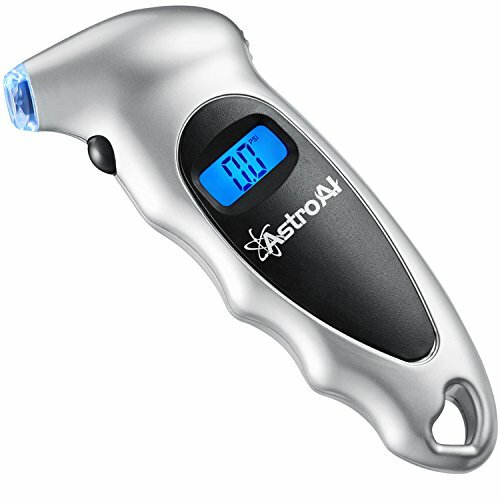 Overall, the AstroAI tire gauge is a must-have for every car tool kit. This device comes quite handy whenever you need it. It’s also perfect for bicycles, motorcycles, and trucks. Now this one’s another reliable digital gauge. 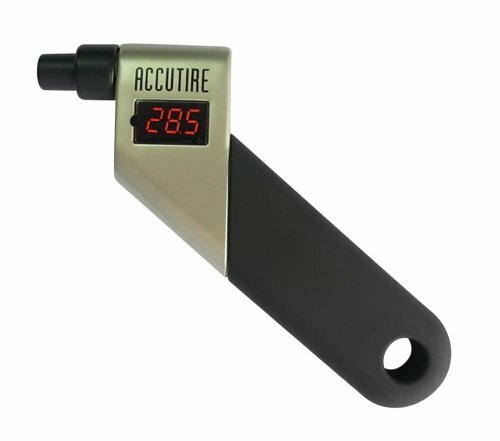 The Accutire pressure gauge comes with a cool, distinct design that is unlike any other digital gauge in the market. It has the looks; and it certainly also has the functions. The angled head is something that makes this one extremely unique among other digital gauge designs. The Accutire also has a rugged design with heavy duty construction – crafted for longer usage. You can easily hold this one; the handle is coated with rubber for a convenient grip. Further, the unit won’t have any hard time being in your toolbox; it’s robust enough to withstand harsh conditions. It also has a standard LCD display – large enough and quite easy to read. Additionally, it comes with pretty standard features including an automatic shut-off technology for battery saving purposes. More importantly, the Accutire is fairly accurate in reading pressure levels from 5 to 150 PSI. It is accurate up to the second decimal in 0.5 pound increments. What makes this model more appealing is it comes with a replaceable battery. Moreover, the unit comes from a reputable brand with over two decades of experience in manufacturing sensor-based consumer products. This one’s a little more humble at 100 PSI but still has features to boast. This one comes with a nifty, highly portable design. The TEKTON looks quite similar with the AstroAI and also has comparable features that doesn’t go far from the other. This one is designed with an easy-grip shape – small enough to be functional and to work as expected. You can rely on the TEKTON to attain precise readings. And because it is digital; you won’t have to spend time manually reading the pressure because it already does the job for you. All you need to do is to read the LCD. Like the AstroAI, it comes with four settings; accurate between 0 to 100 PSI in 0.5 increments. The nozzle is also engineered in such a way it easily seals with the valve system. This makes it possible to prevent any excessive air loss when you open your tires. The unit is also smart enough to turn itself off after about 30 seconds of inactivity. The texture of the material is crafted in a way that prevents any handling slippage so you can have the most convenient way of gripping the unit. This makes an ideal gift item to yourself and to anyone who doesn’t have any pressure gauge yet in their toolkit. This is another must-have if you own a car or any vehicle for that matter; be it a bicycle, motorcycle, or even a truck. You may have a little bit hard time reading the LCD because it is in the handle itself. But this is not some sort of a big deal actually. It just takes a little trick to hold the unit. If you are person who wants to stay traditional, then a dial pressure gauge is right for you. An analog is the type that is ready all the time. It doesn’t rely on any battery so you can always be sure that you can use it right when you need it. Also, there is something so fulfilling in reading and analyzing pressure levels by yourself without depending on a computerized system. This model is ideal for any tire that requires pressure up to 75 PSI. 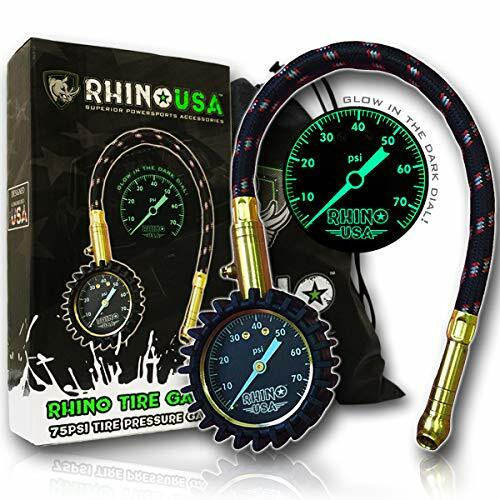 The RHINO is a HIGHLY accurate 2-inch reader gauge – something you can really expect from an analog gauge. It is carefully calibrated to get at par with certain accuracy standards. You don’t have to worry about dim environments. The RHINO comes with a glowing dial so you can easily analyze the reading in darker places. Another impressive feat is the solid brass hardware and premium braided hose; you are really getting the right value for what it’s worth. It snaps in the tires easily and the hose doesn’t leak at all. The unit feels quite solid in the hand. It really feels premium without any cheap feeling no matter where you look at it. 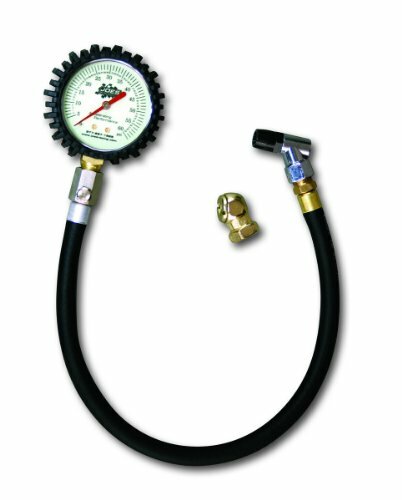 Ultimately, this pressure gauge is ideal for any vehicle type – cars, RVs, motorcycles, and trucks. This one’s got a long, flexible hose that reaches up to 17 inches. 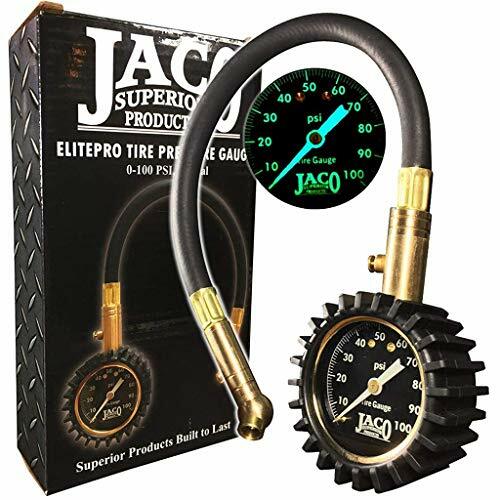 The Joes Racing tire pressure gauge is ideal for car owners looking for a traditional way of reading pressure. This model is perfect for any applications between zero to 60 PSI. The package comes with the necessary items needed to do the operation – including a ball chuck and a chrome angle chuck. The latter can be found in the swivel fitting. This makes the unit versatile and still functional even in tight clearances. The face glows in the dark making a dimly lit garage still a conducive place to test for pressure levels. An impressive feature includes the air bleed button – you can conveniently drain excessive pressure with a simple push of a button. The bleed button allows you to achieve the desired pressure. The manufacturer also offers another model – the PN # 32310. This model has a specially designed valve that “holds” the pressure on the face until you allow to release it. This is a great feature for owners who needs the pressure reading held on for longer. Overall, the Joes 32307 is a solid, well-made, and accurate analog pressure gauge that does its job as expected. Now we have another durable pressure gauge. The TireTek Flexi-Pro gives the most precise measurement possible as it’s calibrated to an international accuracy standard. You’ll also love how you can adjust the pressure accurately with the integrated bleed button. This device lets you take pressure readings at any desired angle with the rotating nozzle that is angled at 360 degrees. It gives accurate reading from zero to 60 PSI without the need for any battery! Further, this analog pressure gauge can work anytime even with the harshest weather conditions. The thing that makes this device standout is the large, easy-read scale. Impressively, it has a pressure holding function capability – the gauge will keep the reading even after you take the valve off. This feature is quite convenient at certain situations. The manufacturer dubbed this product as “recommended by mechanics” and it’s not surprising to see why. This is a top-rated product made of steel. It even has an extended 5mm chuck tip –secures the seal to prevent leaking the air. The rubber is also reinforced; a proof of superior quality. All these factors add up to make a professional tire monitoring system. Overall, the TireTek is a useful automotive accessory that you shouldn’t miss in any tool kit. This is a valuable item for any owner of cars, SUVs, trucks, bikes, and a whole lot more. Now this one’s another premium-looking pressure gauge. From the looks itself, this one lives up to its name – ElitePro. The gauge feels quite solid in the hand; designed like a gear so it doesn’t slip while holding. It also serves as a protective guard, making this one really premium and heavy duty. This is another great option for anyone wanting to have an extremely accurate pressure reading up to 100 PSI without relying on batteries. The air hose is flexible and doesn’t leak, promoting an easy pressure-reading process. The JACO ElitePro is certified precise and professionally tested. Matter of fact, this is also another model the mechanics recommend. Say goodbye to overinflated tires with the integrated bleeder valve. You’ll also be grateful for the swivel chuck that works 360 degrees so you can work at your most convenient angle and position. The 2-inch dial also glows in dark for added visibility when you are working at night. Further, it has a pressure reset button. This means the reading will stay in place for you to double check even after you disengage the device. It will only reset when you press the button. The primary thing you should look out for is accuracy. All other features would mean nothing if the device is not accurate in the first place. Being certified accurate is a must. All products featured here are calibrated to a certain high-precision standard, making them truly the best tire pressure gauges. You might want a digital type with a backlit LCD. That way you can see the readings even if you are in a dark road. You must also look out for those models having a nozzle light. You won’t have any difficulty finding the valve because of the light. For analog enthusiasts, it’s best to look out for those models capable of glowing in the dark. This makes reading the dial possible even in low light conditions. It may not be the most important factor but the material of the pressure gauge still counts. You may want to have a unit that is sturdy and can withstand different weather conditions. For analog pressure gauges, you would want to look out for those gear-like outer casing. That type of material offers more resistive capabilities against shocks and drop impacts. The hose must also be flexible and made of high-grade rubber. For the digital type, it’s ideal to have a metallic body. The design must also be good for gripping. Non-slip texture is a plus. 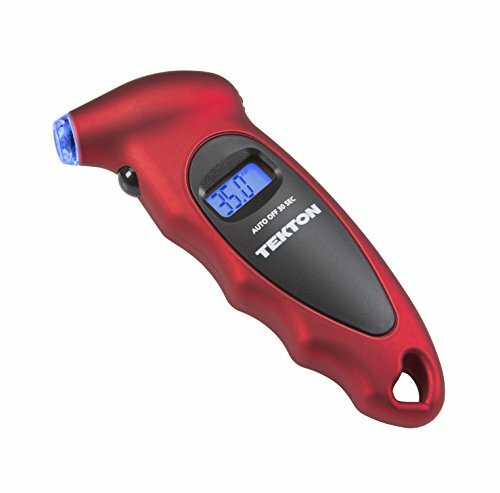 Your search for the best tire pressure gauge ends here! Now it’s a matter of finally deciding to invest in one of these pressure gauges. If you feel confused between the two types, why not go for two? It would be wise to keep a digital gauge and a dial-type gauge at the same time. That way you can compare two readings to confirm that you’re really getting the right pressure level. Or you can keep one for emergency purposes.